Punch was a British weekly magazine of humour and satire established in 1841 by Henry Mayhew and engraver Ebenezer Landells and ended in 1992. 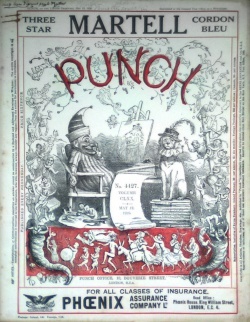 The cover of Punch was drawn by Richard Doyle, the uncle of Arthur Conan Doyle. The magazine published 1 short story and 1 poem written by Arthur Conan Doyle in 1898 and 1900. This page was last edited on 19 August 2016, at 17:56.